What is White-listing? And Specifically, how do I add email address to my safe senders list in my email client or software? White-listing is specifically allowing emails from a certain source, such as gmail or hotmail to be allowed into your email inbox. Adding such trusted email addresses to your white-list so that they can pass easily through your spam filter or junk folder varies across different email clients and platforms. Here are the Top 5 Email Services you can use to white-list. Just select your service. Click Always display images from (senders address). Click Mark as safe next to the From name and address. Go to the Actions option in the top tool bar. 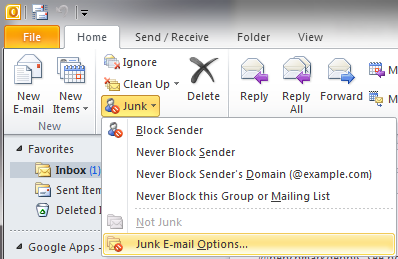 Select Junk E-mail from the drop down menu. Select the Add Sender to Safe Senders List option. Now click Add contact next to the From name and address. Once you have done this take a screenshot and send it back to me. i'll send over my free video training on how to get started in Affiliate Marketing within 24 hours.